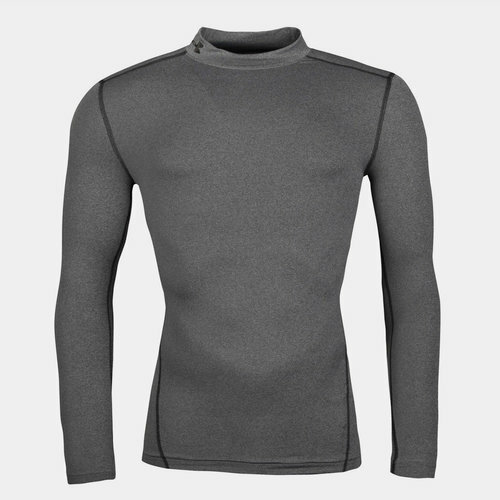 It's cold outside and you're feeling the chill so now's the time to pull on Under Armour's ColdGear Compression L/S Mock Top. Keeping you warm, dry and light, this is often associated with rather more bulky clothing. Not so with this ColdGear offering as it packs plenty of warmth inside the thin material so you're well protected from the cold and certainly not weighed down. Made from soft polyester and elastane, the compression fit sits snug against your body to bolster muscle support and enhance your performance. A brushed finish to the lining adds that extra soft touch that you'll really appreciate on those chilly training days and nights while an updated, ergonomic neck also adds a neat touch. Sporting a grey look with black stitching, Under Armour position their logo on the collar and back of the neck.